I didn't have any pumpkin spice on hand, but really wanted to try this recipe. 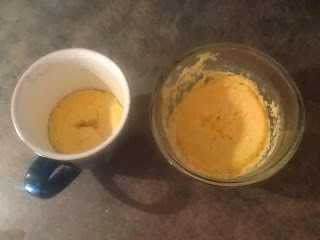 I googled and quickly found a few version of pumpkin spice mix, and made the above mix (in about 1/4 of the quantity). Having read about the explosions and mess that these mug cakes can create, I approached this recipe a bit cautiously. I also didn't have a really big mug that I could use, so I decided to split the recipe into two, one half going into a regular sized mug, and one into a glass bowl. I also read that it is helpful to microwave at 70% instead of full power, and open the door once or twice when the mixture looked like it was about to overflow. Following those tips, I was able to make this recipe without any mess! The two cakes looked moist, and the smell was divine. It really smelled like a pumpkin pie was in the oven on Thanskgiving! 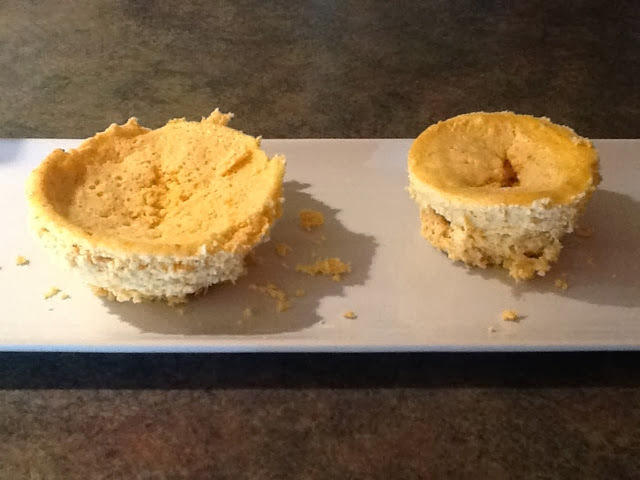 The cakes came out quite easily from the mug/bowl, although they were a bit crumbly. My first bite was everything that I expected and more. I loved the orange flavour mixed in with the spicyness of the cinnamon/ginger/nutmeg. The texture was nice, moist but still crumbly. The warm cake was satisying on a cool fall day. The size was a nice treat, getting two little cakes for just one IP package. However, I waited a bit to eat the second cake. It was not warm anymore, and became quite dry. It was very crumbly and I needed water to wash it all down. I added a bit of Walden Farms Pancake Syrup, and this really helped. I may try to be brave next time and cook it all at once. And definetely to be eaten while still warm.